As I mentioned in my previous post, I have been sick all week and yesterday was the first day I felt, somewhat, human again. I joined the land of the living by descending from my upstairs bedroom and going out for awhile yesterday. I ended my evening early by curling up on the couch in my pajamas with a blanket, happy I could breathe on my own again and glad the worst of my illness was over. I decided to scan Netflix to see if there was anything that interested me. After scanning only a couple of minutes, I saw a movie that caught my attention. I preview a movie, basically, the same way I preview a book. The odd title caught my eye, but the cover didn't really interest me. The little synopsis seemed to pique my curiosity a bit. I wasn't really in the mood for a romantic comedy, though (which is how it was described), and was about to change to see what else was available when my husband said, "Wait. Why don't you try that one? It rates it 4.3 stars. That's pretty high for you." He was right. I don't typically find anything rated that high when I look for a movie. And I know Netflix considers things I've watched before to determine if I'll like it. I looked at the clock, looked to see how long the movie was, and determined I would give it a try. I had already decided that if I didn't like it after watching a bit, I could always go read a book. 4.3 stars? Yep. They nailed it. Now, you could say that some of my euphoria came from the fact I was happy to be alive, which is probably true,...but it was just a great, fun film! 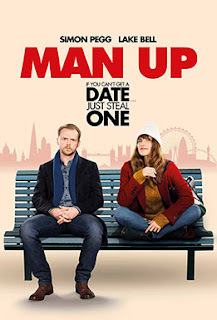 The premise of the movie is that a thirty-something year old woman, who hasn't been lucky in love, is standing under a big clock in the train station when she is approached by a man who mistakenly thinks she is his blind date. She decides to go along with it and allow him to think she's the girl he's been set up with. It ends up being quite an interesting date. Did I mention I wanted to watch a movie because the book I'm currently reading is about a man who owns a little old-fashioned cinema in Paris? The narrator in the novel references movies I love and reminded me of the magic of getting lost in a film. He mentions that 'after glow' of carrying a piece of that art in your heart after the movie is over. I definitely enjoyed that "movie magic" feeling from watching "Man Up" and was still smiling (and chuckling) after the movie was over. And, yes, I thank my lucky 4.3 stars for a lovely evening!